It’s not that you don’t have the patience for it, but going shopping for a shampoo may get a bit trickier when you see all those labels and you simply feel…lost (to say the least). Hydration, anti-frizz, shine, volume, for taming, for curling, for straighten…say, what? We’ve all been at some point in the situations of not knowing what we wanted to buy in the first place. And, like this wasn’t enough…there’s the clarifying shampoo. We have to make it clear. Does the clarifying shampoo clear or it’s something you need to use when you feel your hair it’s not …clear enough? When you get to talk with someone in the hair industry you get to find out that clarifying shampoo really relates to “deep-cleansing”. Yes, sure, a regular shampoo might get the usual oil and residue out of your hair, whereas a clarifying formula helps you get rid of the gunk- you remember using that hair gel? Well, that thing doesn’t go away that easily! Let’s not get all cozy and relaxed and think that if you’re not using hair-styling products, your hair doesn’t need the clarifying shampoo. Guess what! 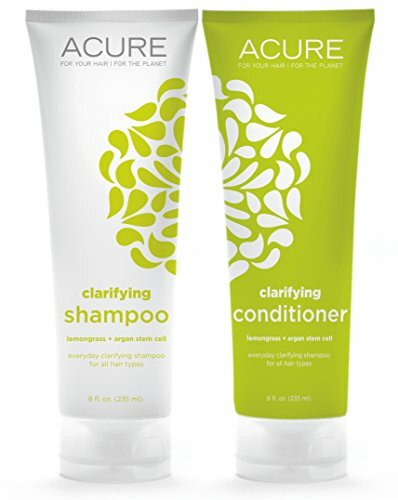 Even the regular shampoo and conditioner may build up some residue in time, so your kind of need to use the clarifying shampoo to clear…the shampoo? Every time you go the pool or use a dry shampoo- that’s the occasion for which you need to use the clarifying shampoo. Take a look in mirror and if your hair looks dull, heavy, greasy…there’s your reason for start using the clarifying shampoo. Well, we can’t decide for everyone, but the more hair styling products you are using, the more often you should use the clarifying shampoo. When you use hair products on regular basis or the water from your pipes is hard, you may want to use the shampoo once or even twice a week. If you are a swimmer, you should definitely use the clarifying shampoo more than twice a week. When you don’t find yourself in any of the category above, using the clarifying shampoo 1-2 times in a month should be enough. You don’t have to be a rocket scientist to know how to use the clarifying shampoo. You use a nickel amount of the shampoo and you work it into your scalp for around a minute. This type of shampoo doesn’t lather much, so don’t get panicked. You should give it a good rinse and use the shampoo once again. Don’t get panicked again if you see all that suds- it’s only natural. Let the shampoo sit for a while (patience is required) so that it gets rid of all the buildup. Remember how we said to give a good rinse? Well, multiply that by 10 and really rinse this time. Keep in mind that clarifying shampoo doesn’t moisturize your hair so you should use more conditioner than usual. We can’t put our finger on it, but we’re sure as hell that there is no best clarifying shampoo for natural hair, for instance. Some brands may work better for your hair, some may be a complete waste of time and money. Sure, some are more popular as they give better results, but this doesn’t mean they are the best choice for your hair. You can use clarifying shampoo even if your hair is colored. And, if you are training for the Olympics as you are a professional swimmer, it may be that your hair may not recover even when using the clarifying shampoo. In this case you can get some help from a professional treatment. Or stop swimming. Whichever fits you the most. If you find yourself sitting on a fence as you don’t even know which type of hair is your hair, get a reliable option like Redken Hair Cleansing Cream Shampoo that matches all hair types. The shampoo is great for purifying and cleaning your hair, leaving you with a nice and shiny hair. The formula is made so that it’s able to remover copper, iron, styling product build-up or other hard water minerals. If you are thinking of using some chemical services any time, this is the shampoo to use before you do it. The shampoo is gentle and efficient and leaves your hair clean, clear and free of all dirt, oil or chlorine. It leaves a good lather and a shiny, healthy look and feel on your hair. The shampoo doesn’t dry your hair and you may use it once a week. It’s a great choice for the thick, coarse or curly hair also. The shampoo wears a nice smell and an amazing feel. The hair remains light, silky and clear. All in all, if you are in the dark when it comes to your hair type or want to play it safe, give the shampoo a try anytime. This may seem impossible to some, but we actually think you don’t need to spend your rent money (yes, we took it a bit over the top) in order to get a clarifying shampoo that works for your hair. 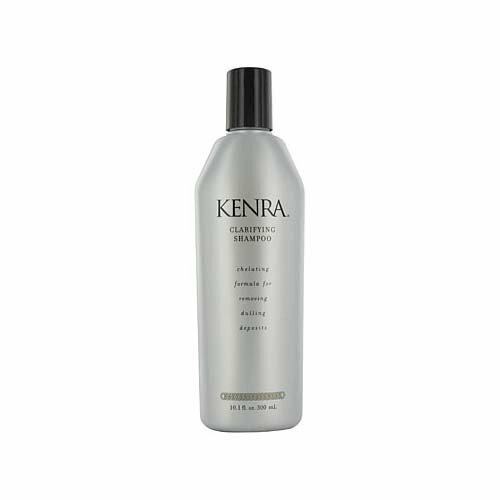 It’s the case of the Kenra Clarifying Shampoo that deeply cleanses your hair and may last you for quite some time. The shampoo helps with the removing of the deposits in your hair, without drying it or damage your hair color. This way your hair wins back its natural shine and all the dull deposits and build-up are gone. The shampoo has an efficient formula that also gives back the bleached, gray or highlighted hair a natural bright. 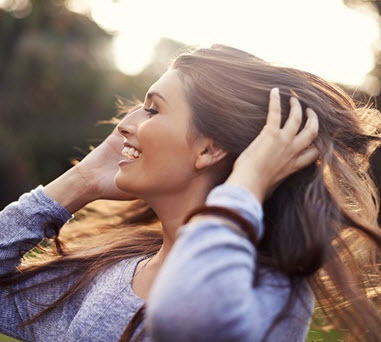 Your hair not only feels, but also looks healthy. In case you are using hard water or well water on regular basis, the shampoo is great to use. The shampoo cleans thoroughly and lathers very well. It has a gentle texture and doesn’t weigh down your hair. it leaves a nice, subtle fragrance behind that fades away nicely. The shampoo gives your hair not only a deep cleanse, but also natural shine and volume. A little goes a long way so the shampoo lasts for several months. As the cons are minor, we think the shampoo is a great option, for a fair price. If you go swimming on daily basics and your hair needs a deep cleansing every now and then, give it a go with the Paul Mitchell Shampoo Three, Removes Chlorine and Impurities. The shampoo is a great choice for any swimmer, no matter if he/she trains for the Olympics or not. It’s efficient when it comes to helping your hair get rid of chlorine or other impurities. Your hair gets deeply cleaned and is free of oil, dirt or hair products build-ups. And, don’t act surprise when you see your hair get back to its original natural shade. Just to be clear, the shampoo works also on colored hair and it doesn’t fade away the color. If you worry about the strong formula of the shampoo, don’t be as the shampoo doesn’t stir up any of your allergies. It’s gentle and wears a nice, subtle smell. The shampoo lathers very well. Your hair remains healthy and shiny and there is no green color from chlorine left in your hair. You can use it daily if you swim daily. You may also benefit from the shampoo in case your hair is oily. You can use the shampoo twice a week for better results. You may also use an efficient conditioning to hydrate your hair. Is a great choice for the professional swimmer? Whenever in need for a shampoo to clean your hair from chlorine, more than anything else, the clarifying shampoo is a definite “yes”. When you are willing to pay the extra buck, don’t hesitate and give it a go with the Oribe Cleanse Clarifying Shampoo. The shampoo purifies your hair and scalp and cleanse it from dirt, oil and any other product buildup. The shampoo is an aerosol mousse that transforms into a creamy texture when mixed with water. The clarifying shampoo removes mineral buildup from hard water and chlorine, so the shampoo is a good choice for any professional swimmer. The formula prepares also the hair for the hair treatment and any other processing. You should massage foam into hair and scalp and rinse it in the end. The Oribe Signature Complex (watermelon, lychee and edelweiss flower extracts) protects the hair from photoagin, oxidative stress and the deterioration of natural keratin. The formula fits the color-treated hair also, not only the natural one. The Volcanic Ash cleanse the hair strands and scalp and helps you get rid of oil, dirt, product buildup. 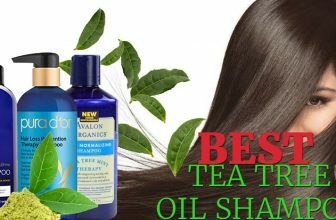 Your hair remains shiny, healthy and very clean, still full of the natural oils. Sea Kelp Extract clears pores and buildup, maintaining a clean scalp at the same time. the hair cuticle becomes softer thanks to the Papaya fruit extract that is full of enzymes, minerals and nutrients. The hair strands get stronger as the shampoo contains also Green Tea Extract. The hair doesn’t break or get damaged that easily. The final touch comes from the Eucalyptus that gives a fresh feeling to the scalp and a healthy appearance to your hair. The formula fits the greasy hair, but also the dry scalp as it minimizes the flakes. You should use the shampoo once a week or more often than that, according to your needs. As the shampoo cleanse and gives your hair a fresh and healthy feeling, you should use it once a week. The more you are willing to pay for your clarifying shampoo, the more you may expect from it. The Agave HEALING OIL Clarifying Shampoo not only clears your hair the buildup, debris, dirt, but it also hydrates and nourishes your hair. the shampoo has a gentle formula and it contains no sulfates, parabens or phthalates. The pH balanced shampoo cleanses gently cleanses your hair. It lathers nicely, but it also enriches and conditions your hair. the shampoo contains agave plant sugars that hydrate your hair thanks to the moisturizing emollients. The color of your hair remains the same as the shampoo doesn’t fade your color. The wheat proteins inside the shampoo make the hair stronger and shinier. The vanilla and coconut condition and make your hair bouncy and easier to manage. Last, but not least, the Madagascar Baobab Seed Oil nourishes and takes care of the outer layer of your hair. The hair looks shiny and healthy. Despite the cons, we still think the shampoo is an option to try. If you want to put your natural curls not only under some control, but also want to clean them deeply, don’t hesitate to give it a go with the Coppola Keratin Complex Smoothing Therapy, Clarifying Shampoo. The shampoo deeply cleans not only the curly hair, but all hair types. The hair cuticle gets cleared by all the hair products residues, oil, dirt or hard water. The shampoo manages to remove all residues still hanging in your hair. You can really see the differences when using the shampoo. The shampoo has a nice, soft formula that doesn’t bring any damage to your hair. 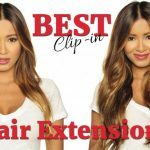 it makes your hair smoother, easier to style. Your natural curls remain bouncy and well defined. As the high pH level opens the hair cuticle, the shampoo is also great to use before applying the Natural Keratin Smoothing Treatment. As it makes your curls not only bouncy and shiny, but also deeply clean, the shampoo is an option to try from time to time. For your dry hair that needs constant hydration and good moisturize, you can try a shampoo that also takes good care of the dry texture, not only of the cleaning. You get all that you need for your hair with TheAcure Organics Lemongrass and Argan Stem Cell Volume Natural Shampoo and Conditioner Bundle so you don’t have to shop for a conditioner either. Let’s talk about the shampoo that combines in its formula Lemongrass and Argan that boost up the stem cell keratin in your hair. The shampoo is sulfate-free and paraben-free so your hair remains clean, healthy and shiny. The Argan oil detangles your hair and sustains the keratin treatment also. The CoQ10 is efficient and makes the shampoo an efficient formula for your hair, whereas the organic cocoa butter moisturizes your hair. 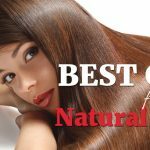 The natural formula, that combines soft ingredients, make your hair shiny and healthy, repairing follicle connections and boosting the hair keratin. The shampoo calms down the frizzy, curly hair. it has a rich, heavy formula (which might be too much for the fine hair). The shampoo lathers nicely and the hair remains well hydrated. As it hydrates, moisturizes and cleanses your dry hair only using natural ingredients, we take the shampoo as a reliable option anytime. Having nice, curly, full of personality African American might be a joy from the outside, but it may be a bit overwhelming at times (to say the least), especially when your hair gets too dry or difficult to detangle. 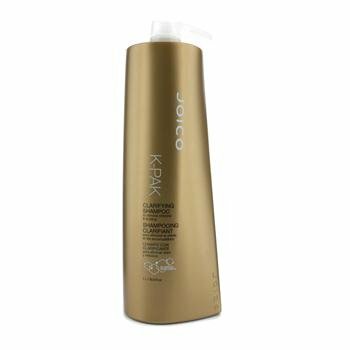 You can do something about it with a good, efficient shampoo like Joico K-Pak Clarifying Shampoo that doesn’t just leave your hair clean of all the hair product build up, but it also keeps dryness at distance. The shampoo is great as it gives back your hair its natural texture (in case you totally forgot it from all that coloring and processing). You don’t have to worry about your hair drying out from the shampoo. Your hair gets cleaned from all the chemical stuff you get when swimming. It deeply cleans the hair from the mineral deposit, product build-up and debris. Your hair gets easier to detangle, easier to style and shines as it’s totally clean. The formula of the shampoo is lightweight which is why the shampoo also works on the fine hair. the shampoo nourishes and enriches your hair. The efficiency on the cleansing of the formula comes from strong ingredients, but the formula is balanced. The Bio-Advanced Peptide Complex combines various proteins that protect the hair from cuticle to the ends. The shampoo wears a nice smell and is a great choice when you swim very often. Your hair remains soft, bouncy and shiny. The cons aren’t deal breakers on our part and we think it’s a great choice for the African American hair. 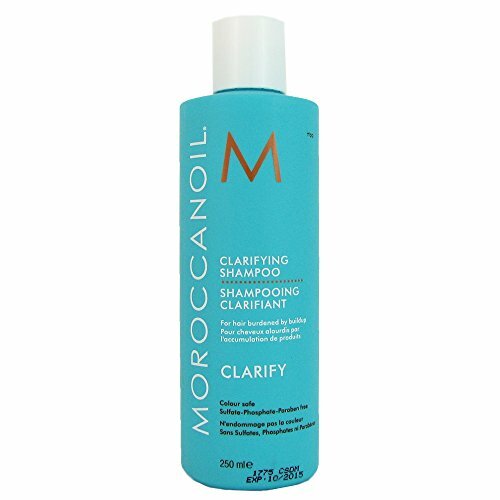 When you want a clarifying shampoo that doesn’t just cleanse out your hair, but also helps with its oily texture, the Moroccan Oil Clarifying Shampoo is a good option to try. The formula is concentrated and helps you get rid of the buildup. You need to add water and massage gently the shampoo throughout your hair and scalp. In the next phase, you should rinse until water runs clear. If you feel your hair needs another round of the shampoo, you repeat the steps. The shampoo gives the best results if it’s followed by a Moroccan oil conditioner or mask. As the shampoo cleans your hair and scalp very well (up to the point you may find it to over dry your hair), it’s better to only use the shampoo twice a month. This doesn’t apply to the professional swimmers or those of you using the hair styling products on regular basis. If that’s your case, you need to use the shampoo even twice a week. The shampoo wears a nice Argan scent, that lingers a little bit. The shampoo also fits the itchy, dandruff prone scalp. The shampoo is sulfate free and contains no Parabens either. It’s full of natural ingredients and cleanse your scalp and hair completely from dirt, oil and any other buildup. If you are thinking of changing your hair color, it’s better to use the shampoo before you do it. 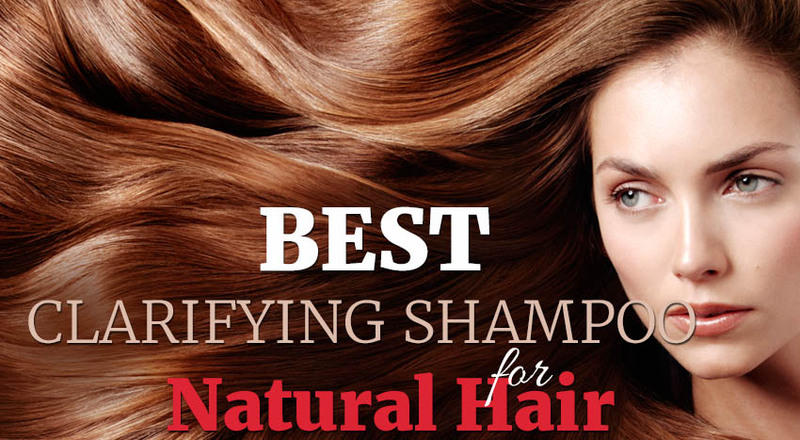 Despite the cons, we still think the shampoo is a great option to deeply clean the oily hair. When you already got your hair through some chemical processes, like relaxing it, you know you kid of need to add the extra buck for the hair products that maintain your hair healthy and nourished. 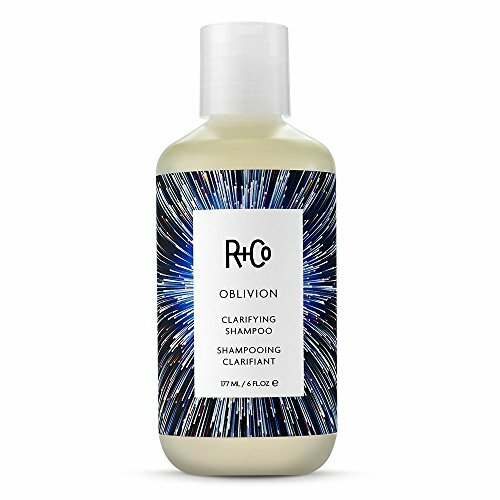 You can use from time to time a clarifying shampoo like the R+Co Oblivion Clarifying Shampoo that takes out of your hair any buildup from chlorine, hard water and, not to mention, the styling products. The shampoo has a nice formula that gently cleanse your hair and removes any buildup. Unlike most clarifying shampoos, you can use the shampoo daily thanks to its soft formula. The shampoo is full of natural ingredients. The Coconut oil makes your hair stronger and conditions your hair, the Rosemary leaf extract removes the disliked buildup, whereas the Witch Hazel clears the scalp and the hair. You can also find in the shampoo amino acids which help the hair seal in moisture. Your hair also becomes shinier and the dull and damaged hair is gone. There are some more natural ingredients: Sicilian lemon, tangerine, green tea, tree moss, crisp amber, eucalyptus. All of them create a formula that is not only soft and gentle, but also nicely perfumed. The shampoo leaves a nice smell after use that stays a while. The shampoo doesn’t contain any parabens, sulfates, gluten or mineral oils. A little goes a long way, so the shampoo lasts you a while. It comes in a small size, which is great for travelling. The shampoo lathers very well and leaves your hair clear, shiny and detangled. Despite the minor issues, when in need for a shampoo for your relaxed hair, this is a sure choice.